Solomon Islands and New Caledonia have taken a huge step toward the semi-finals of the OFC U-19 Championship with two important wins at Stade Pater in Tahiti this evening. Solomon Islands opened the day’s action with a narrow 1-0 victory over their opponents Fiji, while New Caledonia romped to an 8-1 win over Vanuatu. Heading into the game with a victory in their respective opening matches, Solomon Islands and Fiji were looking to continue their winning run in Group A. Both teams had created good scoring opportunities in the opening half but just lacked the required finishing in crucial moments, leaving them in a scoreless deadlock at the break. The game opened up in the second half with Fiji having the best chance in the 49th minute which somehow denied by a combination of good goalkeeping and sheer luck by Solomon Islands. Junior David was a real threat on the right wing with two chances inside two minutes but Fijian keeper Mohammed Alam was equal to the task. The onslaught from the Solomon Islands eventually proved too much for the Fijian defence as a momentary lapse allowed substitute Tuita Maeobia to score in the 89th minute off a David assist. Solomon Islands coach Batram Suri gave credit to his players for the tireless effort in their second win of the tournament. “I think the boys did well, especially in the second half because in the first half we were 50-50 with Fiji,” he said. Fiji coach Bal Reddy said he was disappointed his team were not good enough to secure another positive result after the deserved opening win against Vanuatu. “We are really disappointed I would say, we were also looking for a win or a draw that will good enough,” he said. In the day’s second match, New Caledonia bounced back from a disappointing opening defeat to the Solomon Islands to run out 8-1 winners over Vanuatu. 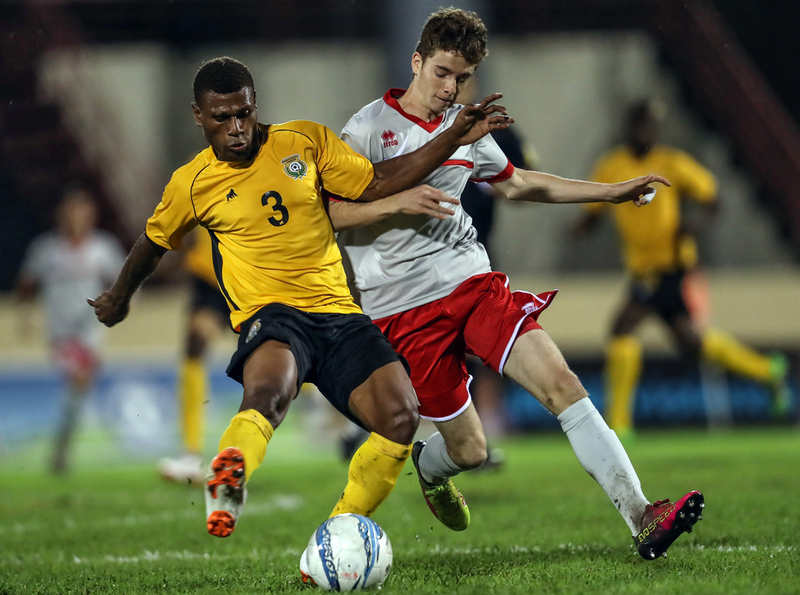 Not only was the victory the worst for Vanuatu at this level of competition in 13 years – the previous being a 9-2 loss to Australia back in 2005 – the 2016 OFC U-20 Championship runners-up will also exit the competition after the group stage. In heavy rain and fast-deteriorating pitch conditions, New Caledonia dominated from the outset, putting the experience of the FIFA U-17 World Cup to work against a Vanuatu side which struggled to deal with both the conditions and the speed of the game. The opening goal came off a cross from Pierre Bako, which was then fired goalwards by the impressive Titouan Richard. The ball came off the back heel of Paul Gope-Fenepej to make it a real team effort to get the scoring underway in the 12th minute. The provider then turned goal scorer as Bako lobbed keeper Dgen Leo from distance after seeing him leave his goal line to extend the lead to with a stunning strike. Bako and Gope-Fenepej combined for a second time in the 52nd minute when the midfielder delivered another perfectly weighted cross into the penalty area for his teammate to finish. After missing out on the right to claim the opener, Richard finally got on the scoresheet just ahead of the hour mark. Lucas Bitaud delivered into the six-yard box where Gope-Fenepej hit it first time only to be denied by the woodwork, but Richard was there to nail the follow up. A couple of minutes later and following a spectacular team counter, Richard was adding his second. Pierre Wawia and substitute Vita Longue added one each either side of a consolation goal for Vanuatu’s Anthony Peli to see the match out. Vanuatu coach Kaison Maki was unavailable following the game but his opponent Felix Tagawa was jubilant in victory. “We had to win and that meant working on our philosophy,” he said. “We altered it for the previous game because I know Fautaua and it’s hard to play with the ball there so we tried to find width quickly. The OFC U-19 Championship breaks for a day before Group A returns for their final match day on Saturday 11 August, followed by Group B on Sunday 12 August.